The Easy-Install was developed for the Bussey-Saksida Touch Screen Systems due to the large number of cables and connections that these systems require. Our engineers designed the Easy-Install as a factory built, pre-cabled system that could be taken from a transit crate in one piece and wheeled into place, eliminating the effort needed to handle, move and install individual stations and their connections to the system interface and control. 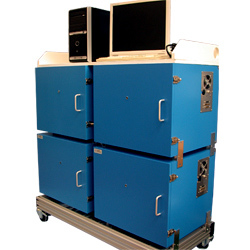 These touch screen systems have one Control PC for up to four (4) touch screen chambers. The Control PC requires an expanded motherboard to accommodate the various installed serial, VGA and I/O boards. Cabling for these plus IR camera and power are routed to each chamber. 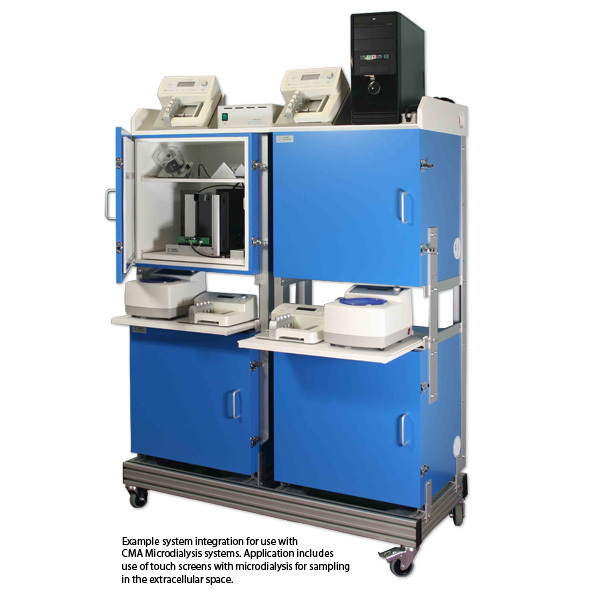 In conclusion, the Easy-Install represents a savings when consideration is given to the ease of installation, the safety features we have incorporated, and the advantages in the efficiency of day-to-day functions of the lab and its cleanliness and tidiness, which offsets the initial cost. The Easy-install follows a concept originally published by John Hopkins University (the materials used by Campden are much more economical but the space saving layout and mobility of chamber is in principle the same). Featured application plans to use touch screens with microdialysis for sampling in the extracellular space. As shown in the image our design enables the lines to the animals to be as short as possible (the entry point to the chamber are at the side at the connection panel with the cooling fan) and the carousel can be rolled in and out on a shelf. Prof. Tim Bussey's profile at the University of Cambridge. Details on the usage of Bussey-Saksida Touchscreen Chambers at Western University. Improving cognitive testing on animals to treat human disorders: Technology developed at the University of Cambridge is transforming the way cognitive tests are performed on animals, leading to more directed experiments and ultimately aiding development of new drugs to treat schizophrenia and other neurocognitive disorders.